เจ้าของกิจการหรือผู้บริหาร ควรมีความเข้าใจในข้อดีข้อด้อยของ Business Model แบบต่างๆ และการเลือกใช้ Business Model ที่เหมาะสมเป็นสิ่งที่มีความสำคัญสุดสุดต่อความสำเร็จทางธุรกิจ และรูปแบบของธุรกิจที่ถูกนำมาใช้จะคงทำงานอย่างต่อเนื่อง เปรียบเสมือนชีพจรของธุรกิจที่เต้นอยู่ตลอดเวลา เมื่อไรที่หัวใจอ่อนล้า หมดแรง ล้าสมัย ชีพจรก็จะเต้นอ่อนลง กำไรและผลการดำเนินการก็จะลดลง ซึ่งก็เป็นสัญญาณบอกเหตุว่าเราต้องการ Business Model แบบใหม่แล้ว ถ้าจะให้ธุรกิจเดินต่อไป! 1. Type of Business: Details of critical success factors for businesses in your industry must be included in the plan. Technology companies will discuss R & D, intellectual property, and time to market. A retailer will feature pricing methods, inventory control, merchandising and location. Ensure that your plan is complete by addressing factors important to your industry. 2. Type of Audience: A banker business plan will be different from an investor plan. Bankers like to see risk assessment and planning, loan amounts, repayment terms and collateral. Investors want a return on investment, an exit strategy, and planned growth with the funds. Executive Summary: overview of most important points of business plan and selling your business. Company Description: mission statement, company overview, industry briefing, corporate history, legal structure. Products & Services: description, R & D, pricing, delivery, production. Marketing & Sales: market definition, customer profile, competitive & SWOT analysis, strategy, sales & promotion. Operations: Legal & government issues, staffing, suppliers, alliances, policies, risk assessment, facilities, location, insurance, milestones. Management: key job descriptions, responsibilities, management team, organizational chart, advisors. 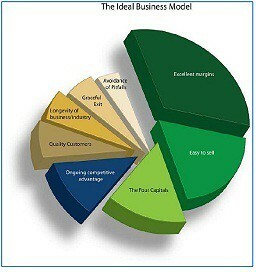 Financials: Profit & loss, cash flow, balance sheet, financing, debt schedule, use of funds and assumptions, break-even analysis. SWOT Analysis: As part of your competitor profile, adding a Strengths, Weaknesses, Opportunities and Threats analysis can show your investors you understand the competitive landscape and your business can operate within that environment. Porter's Five Forces: Michael Porter's 5 forces framework is a standard business tool used by companies to evaluate an industry's key forces. This is an important extra to add to your business plan outline especially if you are a start-up or an existing business entering a new market. Glossary: If your business plan audience is not well-versed in your industry jargon, a glossary adds value to your overall plan. If you are writing a biotech business plan on gene therapy agents, determine the level of knowledge your target audience has on the subject. Publishing Value-Adds: These are simply publication elements to improve the readability and presentation of your plan. This can include: a cover page with logos, graphics, charts, and table of contents. http://sbinformation.about.com/cs/businessplans/a/bpoutline.htm ©2011 About.com, Inc., a part of The New York Times Company. In today's highly competitive business environment, budget-oriented planning or forecast-based planning methods are insufficient for a large corporation to survive and prosper. The firm must engage in strategic planning that clearly defines objectives and assesses both the internal and external situation to formulate strategy, implement the strategy, evaluate the progress, and make adjustments as necessary to stay on track. The mission statement describes the company's business vision, including the unchanging values and purpose of the firm and forward-looking visionary goals that guide the pursuit of future opportunities. Guided by the business vision, the firm's leaders can define measurable financial and strategic objectives. Financial objectives involve measures such as sales targets and earnings growth. Strategic objectives are related to the firm's business position, and may include measures such as market share and reputation. 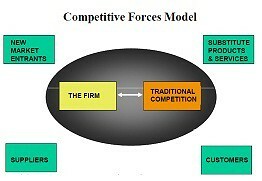 An industry analysis can be performed using a framework developed by Michael Porter known as Porter's five forces. This framework evaluates entry barriers, suppliers, customers, substitute products, and industry rivalry. Given the information from the environmental scan, the firm should match its strengths to the opportunities that it has identified, while addressing its weaknesses and external threats. To attain superior profitability, the firm seeks to develop a competitive advantage over its rivals. A competitive advantage can be based on cost or differentiation. Michael Porter identified three industry-independent generic strategies from which the firm can choose. The selected strategy is implemented by means of programs, budgets, and procedures. Implementation involves organization of the firm's resources and motivation of the staff to achieve objectives. The way in which the strategy is implemented can have a significant impact on whether it will be successful. In a large company, those who implement the strategy likely will be different people from those who formulated it. For this reason, care must be taken to communicate the strategy and the reasoning behind it. Otherwise, the implementation might not succeed if the strategy is misunderstood or if lower level managers resist its implementation because they do not understand why the particular strategy was selected. Perhaps the most comprehensive taxonomy of e-commerce business models is Business Models on the Web by Professor Michael Rappa. This taxonomy includes 40 models organized into nine major categories. Two of the advantages of this list being online are that (a) Professor Rappa keeps it up to date, making changes as new models emerge and current models change and (b) the Web site includes links to examples of each business model. Each category is listed below, with a brief description and a list of the models. Brokerage Model: Brokers are market makers, they bring buyers and sellers together and facilitate transactions in B2C or B2B or C2C markets. Advertising Model: This model is an extension of the traditional media broadcasting model. This model only works when the volume of viewer traffic is large or highly specialized. Infomediary Model: Data about consumers and their buying habits are extremely valuable, especially when that information is carefully analyzed and used to target marketing campaigns. Independently collected data about products are useful to consumers. Infomediaries provide information to both buyers and sellers. Merchant Model: These are classic wholesalers and retailers of goods and services. In other words, "e-tailers." Manufacturer (Direct) Model: This model is predicated on the power of the Web to allow manufacturers to reach buyers directly and thereby compress the distribution channel. Affiliate Model: This model provides purchase opportunities from a number of different sites. The affiliate sites provide purchase-point click-through to the merchant. Community Model: Users who have a common interest in an area congregate at community Web sites. The viability of the community model is based on user loyalty. Subscription Model: Users are charged a periodic fee to subscribe to a service. Utility Model: A metered usage or pay as you go approach. Source:Source: Business Models on the Web by Michael Rappa in Managing the Digital Enterprise, 2005. Applegate proposes a taxonomy of business models that is more extensively described than Business Models on the Web. This taxonomy lists model differentiators, likely revenues, likely costs, examples, and, for each category, trends that will influence the development of these models. Due to space and copyright restrictions, only a fraction of its detail is included here:Focused Distributor Models: provide products and services related to a specific industry or market niche. :Retailer: Like brick-and-mortar equivalents, e-tailers assume control of inventory, set a nonnegotiable price, and sell physical products (Amazon.com, LandsEnd.com). :Marketplace: Marketplaces make their money through commissions and transaction fees when they sell information-based products and services online at a nonnegotiable price, without taking control of physical inventory (Quicken Insurance, E-Loan). :Aggregators: Aggregators provide information on products or services for sale by others, but do not complete the final transaction. Their main revenue source is advertising and referral fees (InsWeb, Autoweb). :Infomediary: This special class of aggregator unites buyers and sellers of information. Because no physical product is involved, the transaction can be completed online. Again advertising and referral fees are the main source of revenue (Office.com). :Exchange: These sellers may or may not take control of physical inventory and may or may not complete the final sales transaction online. The key differentiating feature of this model is that the price is not set; it is negotiated between the buyer and seller at the time of the sale (Priceline, eBay). Portal Models: A portal is a gateway or entry and on the Web a portal business model provides a gateway for consumers to gain access to content or services. :Horizontal Portals: The giants of the portal model, these sites provide a gateway to the Internet's vast store of content, and also a broad range of tools for locating information (e.g., search engines) and Web services (e.g., e-mail, personalized pages, home pages). Their goal is to "attract eyeballs" to appeal to advertisers, which is their primary source of revenue (Yahoo!, Microsoft's MSN). :Vertical Portals: While horizontal portals try to appeal to everyone, a vertical portal specializes in a particular area. Lacking the huge traffic of horizontal portals, vertical portals cannot depend on advertising as a primary source of revenue. Instead commissions and referral fees take up a much larger portion of their revenue (Expedia). :Affinity Portals: These are the most specialized portals of all, offering deep content, commerce and community features to a specific market segment. Like vertical portals, affinity portals must depend on a variety of revenue sources (Women.com, TheKnot.com). Producer Models: Producers design, produce, and distribute products and services that meet customer needs. These are usually brick-and-mortar firms that are integrating the Internet into their core business activities. :Manufacturers use the Internet to design, produce, and distribute physical products (Ford, Pepsi). :Service Providers produce and deliver a wide range of online service offerings (American Express, Citigroup). 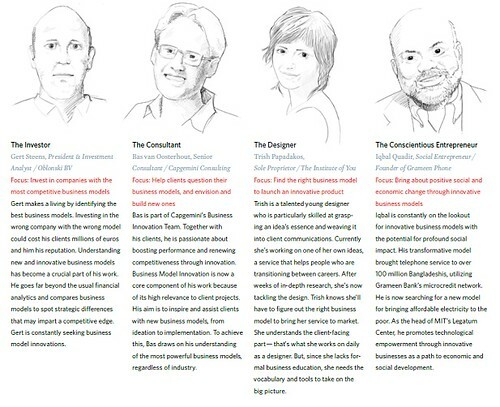 :Educators create and deliver online educational offerings (Harvard Business School). :Advisors provide online consulting and advice (*Accenture, IBM Business Consulting Services). :Information and New Services Providers create, package, and deliver online information (Wall Street Journal online). :Custom Suppliers design, produce, and distribute customized products and services (Boeing, McGraw-Hill). Infrastructure Provider Models: Unlike previous business models that use the digital infrastructure of the Internet, these models provide that infrastructure. :Infrastructure Retailers sell the infrastructure (CompUSA). :Infrastructure Marketplaces take inventory and complete the sales transactions (TechData, MicroAge). :Horizontal Infrastructure Portals include, principally, Internet service providers, network service providers, and Web hosting providers (AOL, Sprint). :Vertical Infrastructure Portals host software applications for rent (Siebel Systems, Oracle Business online ). 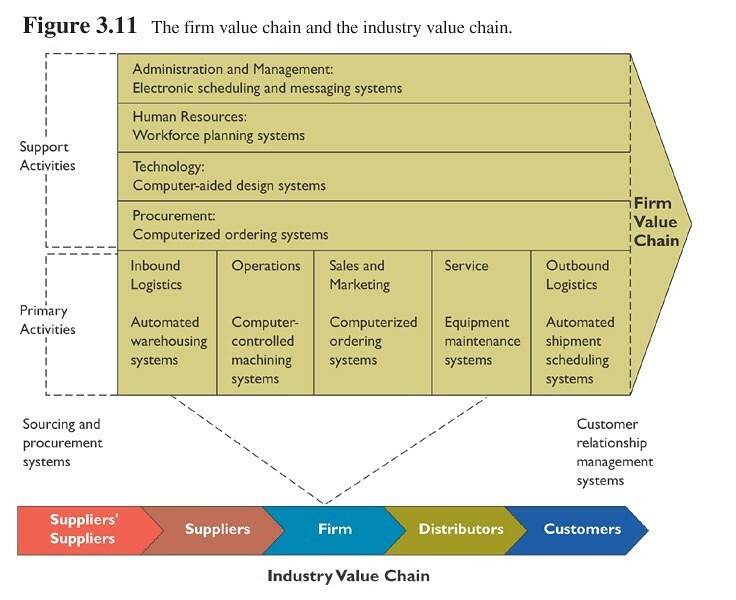 Source: "E-Business Models: Making Sense of the Internet Business Landscape" by Lynda M. Applegate in Information Technology and the Future Enterprise: New Models for Managers, edited by Gary W. Dickson and Gerardine DeSanctis; Prentice-Hall, 2001 (pp. 49-94). :Content Provider: Provides content (information, digital products, and services) via intermediaries. :Direct to Consumer: Provides good or services directly to the customer, often bypassing traditional channel members. :Full Service Provider: Provides a full range of services in one domain (e.g., financial, health, industrial chemicals) directly and attempts to own the primary consumer relationship. :Intermediary: Brings together buyers and sellers by concentrating information. :Shared Infrastructure: Brings together multiple competitors to cooperate by sharing common IT infrastructure. :Value Net Integrator: Coordinates activities across the value net by gathering, synthesizing, and distributing information. :Virtual Community: Creates and facilitates an online community of people with a common interest, enabling interaction and service provision. :Whole of Enterprise: Provides a firm wide single point of contact, consolidating all services provided by a large multi-unit organization. Source: Place to Space: Migrating to E-Business Models by Peter Weill and Michael Vitale; Harvard Business Press, 2001, p. 21.
:E-Business Storefront: An entity in which commerce occurs, margin is created, and value is extracted using existing as well as new digital market channels. When end users need to buy something, chances are they go to an e-business storefront. :Infomediary: An entity that brokers content, information, knowledge, or experiences that add value to a particular e-business transaction; also known as a content aggregator. :Trust Intermediary: An entity that creates trust between the buyer and seller. These firms provide a secure environment in which buyers and sellers can confidently exchange value. :E-Business Enabler: An entity that creates and maintains an infrastructure in which product and service providers can conduct transactions reliably and securely. :Infrastructure Providers/Communities of Commerce: Members aggregated across a set of complementary interests (products, content, and services) and markets; communities of enterprises organized around common interests through a common infrastructure. Source: Net Ready: Strategies for Success in the E-conomy by Armir Hartman and John Sifonis with John Kador; McGraw-Hill, 2000. 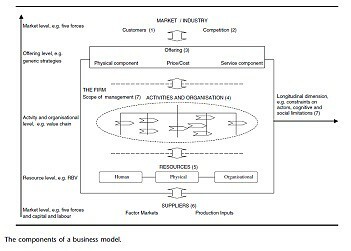 Perhaps the earliest attempt to construct a taxonomy of e-commerce business models was Paul Timmers in "Business Models for Electronic Markets" (Electronic Markets, Vol. 8, No. 2, July 1998). 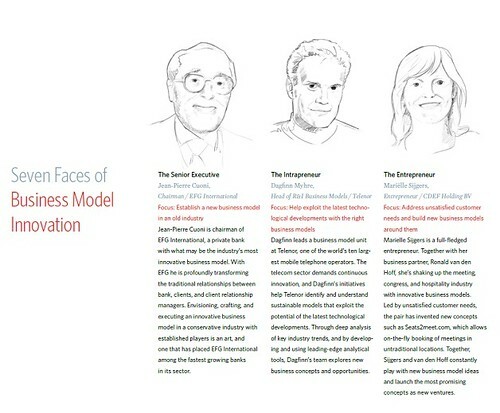 In this article Timmers provides brief descriptions, benefits (for businesses, customers, suppliers), and examples of eleven models: e-shop, e-procurement, e-auction, e-mall, third party marketplace, virtual community, value chain service provider, value chain integrator, collaboration platform, information brokerage, and trust services. Source: "Business Models for Electronic Markets" by Paul Timmers in Electronic Markets, Vol. 8, No. 2, July 1998. Another early effort by Dennis Viehland identified three new or emerging business models that are made possible by the Web: Virtual retailer, distributed storefront, and buyer-led pricing. Source: New Business Models for Electronic Commerce by Dennis Viehland, Proceedings of the 17th Annual International Conference of the Association of Management, August 1999. A slightly approach to classification of business models is taken by Kenneth C. Laudon and Carol Guercio Traver in their e-commerce textbook, E-Commerce: Business. Technology. Society.. They list and describe various models by type or mode of electronic commerce: B2C (portal, e-tailer, content provider, transaction broker, market creator, service provider, community provider), B2B (e-distributor, e-procurement, exchanges, industry consortia, single-firm networks, industry-wide networks), and others (C2C, peer-to-peer, mobile commerce). For each model, the authors include variations ("sub-models"), examples, a description, and revenue model(s). Source: E-commerce: Business. Technology. Society. by Kenneth C. Laudon and Carol Guercio Traver, Addison-Wesley, 2003, pp. 72, 82, 88.
:Your textbook, Electronic Commerce 2006: A Managerial Perspective, includes a list of 17 typical EC business models. While some models on this list are similar to others listed above, there are some new twists and an emphasis on auction-type models. This list of typical EC business models (with links to example companies) includes online direct marketing (Wal-Mart), electronic tendering systems (General Electric's Global Exchange Services (GXS), name your own price (Priceline), find the best price (E-Loan), affiliate marketing (Amazon.com), viral marketing (Blue Mountain Arts), group purchasing (LetsBuyIt.com), online auctions (e-Bay), product and service customization (Dell), electronic marketplaces and exchanges (GNX), information brokers (Google), bartering (Web-Barter), deep discounting (Half.com), membership (Net Market), value-chain integrators (carpoint.com), value-chain service providers (United Parcel Service), and supply chain improvers (Orbis). Source: Electronic Commerce 2006: A Managerial Perspective by Efraim Turban, David King, Dennis Viehland, and Jae Lee; Prentice-Hall, 2006, pp. 22-24.